The DeHoff G560-B1 is a custom machine designed to form the rifling grooves in gun barrels. The barrel is rotated by a 3-jaw chuck while a rifling button tool is pulled through the barrel by a hydraulic cylinder. The button tool deforms the rifling grooves into the internal bore of the barrel using a swaging process. All the rifling grooves are cold-formed in a single pass. The G560-B1 can machine barrels from 17 caliber up to 50 caliber, and has a slide travel of 60 inches (1524 mm). It features a pneumatically-operated chuck with programmable "twist rates." The rifling "twist rate," which is the distance the rifling takes to complete one full revolution, is variable from 1 turn in 5 inches (127 mm) to 1 turn in 60 inches (1524 mm). The twist rate, pull speed, and pull force are all programmable via the Beckhoff control. 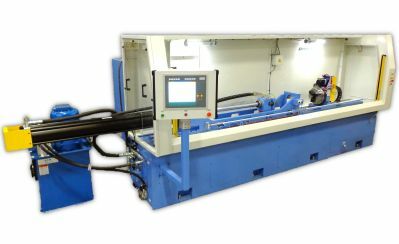 The G560-B1 is part of a turnkey package of gun barrel manufacturing equipment offered by DeHoff, including machines for gundrilling, pull-reaming, button rifling, cut rifling, as well as tooling, stress relieve ovens, and air gauging equipment. DeHoff machines are built-to-order by Kays Engineering in their Marshall, Missouri, USA facility.